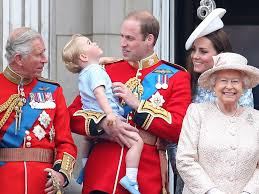 Four generations of Windsors mark the line of succession to the throne. 'WHY DON'T you write about your fascination with the Royal Family?" Keller asked me. "You've probably seen more royals than most Montanans -- probably more than most Americans. And you adore that family." 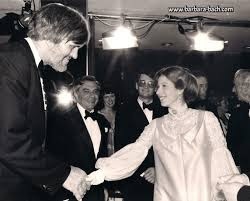 Princess Anne meets gentle giant actor Richard Kiel, who stood 7 feet, 2 inches. He played the character Jaws in the James Bond film, "The Spy Who Loved Me." Princess Anne represented her mother, QEII, at the 1977 screening in London. wedding and honeymoon of Prince Harry and Meghan Markle, a few thoughts on my enduring affection for the royals -- and all things pomp and circumstance. My love affair with them began when I was a toddler, on June 2, 1953. I remember it well. 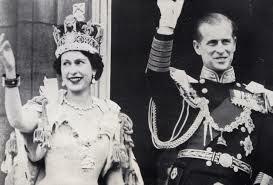 Queen Mum: Beloved and always "hatted"
The occasion was Queen Elizabeth's coronation -- the first to be televised. I sat on my mum's lap (yes, we called her mummy, not mama), holding my grandmum's hand. We were glued to the set, along with 27 million others in the United Kingdom and twice that many Americans. Our three generations joined a fascinated global retinue -- my mother, her mother, I and my infant sister. It all seemed splendid. I asked if the Queen's gown, cape and jewels were heavy. "Yes, they probably weigh half as much as the Queen," mum replied, "for "Elizabeth is a small, elegant woman, don't you know." 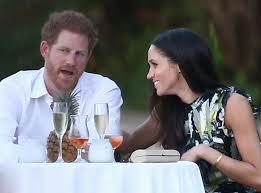 AS PRINCE Harry takes actress Meghan Markle to be his wife, it will be very theatrical. "That's why you love all this," my Keller chides. "It's your theater background." Meghan Markle earlier this year. He's right, of course. What could be more theatrical than centuries-old coaches made of gold, tiaras that weigh more than my Yorkshire terriers, oversized hats, soldiers, horses and endless parties, receptions, concerts and, yes, curtsies. Not least: family. Meghan is changing the royal family and the way it views things. She's divorced, her mother is a proud woman of color. She's American! I've written magazine and newspaper articles about meeting "my two" memorable royals in July of 1977. I was invited by United Artists and the Silver Jubilee to cover the celebration during Queen Elizabeth II's 25th anniversary as monarch. which offered more seating than Westminster. The United Artists film, "The Spy Who Loved Me," was part of the festivities and Princess Anne attended in her mother's place. I remember her as gracious and beautiful, in a satin gown. She daintily shook hands with Sir Roger Moore, who played Bond, and Richard Kiel, who played his nemesis, Jaws. (Kiel's hand was huge so Princess shook only a finger. My photos proved that.) 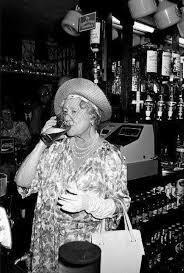 Later, I met Queen Mum at a reception. Queen Elizabeth II in 1984, purchasing souvenirs in Wyoming. I AROSE EARLY to watch Princess Diana marry Prince Charles, and sadly visited the tunnel in Paris where she met her fate. 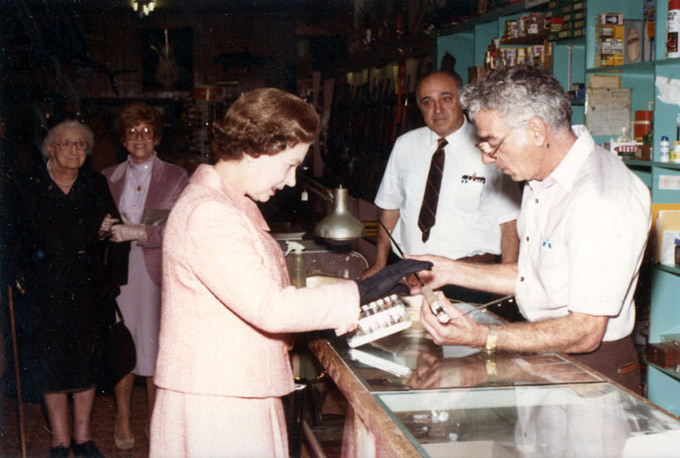 When in 1984, Queen Elizabeth II came to Wyoming to look at horses, no reporters were allowed. An expert rider, the Queen inspected thoroughbreds, rode, hiked and kept a low profile, calling it a private vacation -- no interviews. She did go shopping in Sheridan, dispelling the myth that she carried nothing in her purse. Friends who saw her at Ritz Sporting Goods in the small western town, said she paid cash for her souvenirs. 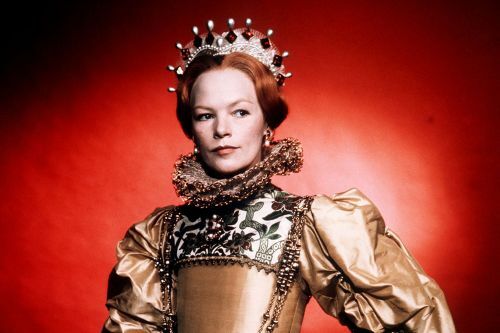 Glenda Jackson as Queen Elizabeth I. She based at the Wallop family ranch in Big Horn and visited the nearby Bradford-Brinton Museum. Her hosts were her friend Lady Porchester, nee Jean Margaret Wallop, a Big Horn, Wyo., native and sister of another prominent Big Horn personality, Sen. Malcolm Wallop. EVEN BEFORE I became a film reviewer, I saw every movie I could about the royals-- particularly Queen Elizabeth I and later Queen Elizabeth II. My favorite QEI actress is Glenda Jackson, although Judi Dench made a magnificent older royal. Bette Davis had just the right amount of grit to give her QEI the proper feistiness. 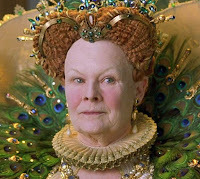 Dame Judi Dench as Queen Elizabeth I. As for the reigning monarch, Queen Elizabeth II has spent over 65 years on the throne and has been fodder for pop culture ever since I watched her put on that first crown -- little Cookie sitting glued to the family's first television. She has been the subject of many impersonations -- including some irreverent ones by Monty Python and many others. The Queen is said to have a good sense of humor -- she'd have to. Cookie and Keller met the Queen Elizabeth when she sailed into Long Beach. An avowed "cruise junkie," Cookie has fond memories of QEII sails. MY FAVORITE ship by far is the now retired Queen Elizabeth II. I crossed the Atlantic on her seven times and sailed the Norwegian fjords and Mediterranean on her. The new Queen Elizabeth is lovely, too, but my heart yearns for the days of dinner in the Queen's Grill, and an interview with Kevin Kline or Josh Logan, two of many celebs I interviewed on that venerable ship. I'd love to interview the Queen -- or at least meet her -- but if not, I've had a good life with "my royals." I wish Harry and Meghan my own royal best. 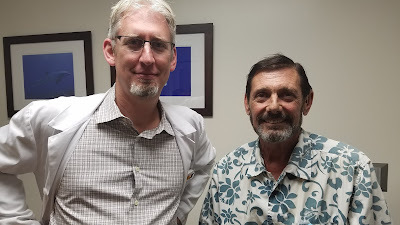 surgeon, Columbia trained Dr. Jonathan Fisher, at Scripps Green Hospital. 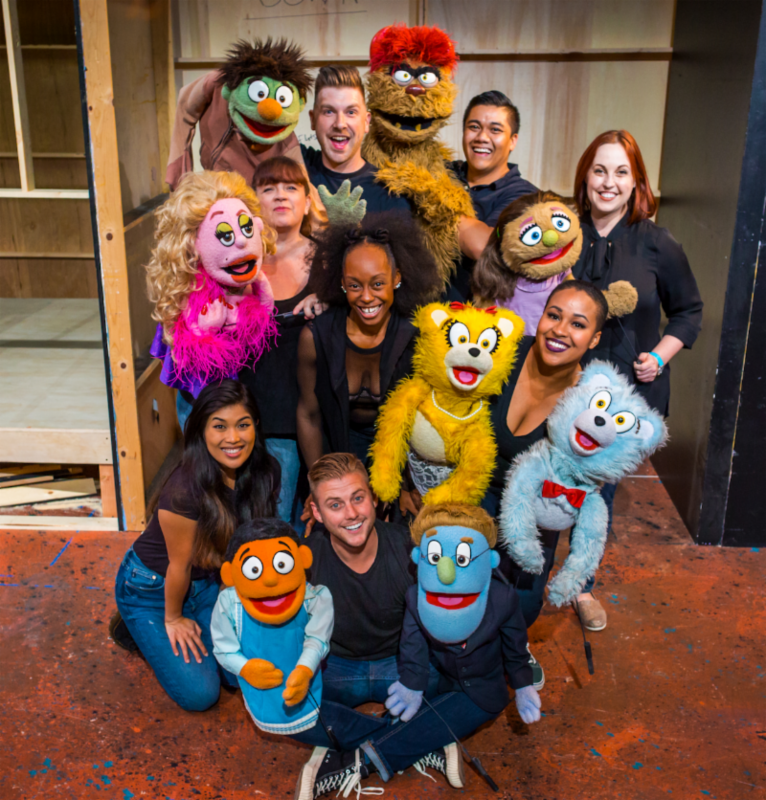 of puppets in the smash hit "Avenue Q" at New Village Arts. NEXT UP: It's been a year of ups and a few downs, since Bruce William Keller had his successful liver transplant. Several hundred readers want to know how it's gone so -- not known for wall flower protocol -- "Nurse Cookie" tells almost all, including how Keller is doing ("fabulous," he says) and how she nearly lost her nurse's cap. Tune in and remember to explore, learn and live. Would love to be there, too, Cookie. Know Sir Elton John and George Clooney are invited. Your usual fun spin. What a delightful read. Love it. We were up, too, with tea and crumpets. I,too, was a tot when Queen Elizabeth was crowned. I remember the royals returning from Africa when they heard the news that her father had passed..... your lovely piece revived many beautiful memories. Thanks for all your lively reporting of global events. Great stuff and fun photos always. 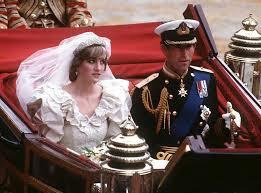 Fantastic look at the royal family -- and your own intriguing life. We hope you are working on a book. Cookie, what a life! Thanks for sharing.